Bryce Dallas Howard braved the frigid temperatures as she waved to onlookers during the Hasty Pudding's Woman of the Year parade, which was followed by a roast inside Farkas Hall. The actress, producer, and director was joined by members of the Hasty Pudding Theatricals dressed in colorful outfits as they danced through the streets. This year will see the Pudding's 171st production, the first time in the show's nearly 200-year history that Hasty Pudding Theatricals has incorporated female students into its formerly all-male cast. Members of The Hasty Pudding Theatricals posed excitedly as they waited for the parade to start in below freezing temperatures. 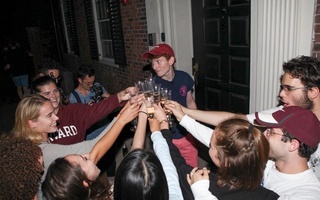 Bryce Dallas Howard, best known for her role as Claire Dearing in the Jurassic World, arrived at the beginning of the parade route near the Inn at Harvard and was surrounded by Hasty Pudding members, press, and well-wishers. The parade also featured other area performance groups including THUD, The Harvard Undergraduate Drummers, who processed down Massachusettes Avenue ahead of the Woman of The Year. The Boston Circus Guild joined the festivities, walking on stilts despite the freezing temperatures. Poking fun at Howard's role in Jurassic Park, one member of the Hasty Pudding dressed up as a dinosaur. Inside Farkas Hall, the Hasty Pudding presented Howard with an engraved Pudding Pot during a playful roast which saw her pie a troupe member dressed as gluten. “This has been totally a blast. I’ll never forget this as long as I live. And please accept my children to Harvard,” Howard said. Howard headed upstairs to a press conference where she answered questions ranging from whether her co-star and former Hasty Pudding Man of the Year Chris Pratt gave her any advice before coming to Harvard, to the struggles that many women in front of and behind the camera face in Hollywood. “My reaction was, ‘I don’t think I’m the Woman of the Year.' I think we’re really seeing examples of individuals and women in particular really taking a stand and being courageous and reaching out to one another," Howard said.